Gustave Caillebotte, Laundry Drying on the Banks of the Seine, Petit Gennevilliers (c 1892), oil on canvas, 105.5 x 150.5 cm, Wallraf-Richartz-Museum, Cologne. WikiArt. Impressionism may seem to have been the biggest change in painting since the Renaissance, but careful study of its immediate antecedents shows that those changes were already well under way. Indeed you could almost say that Impressionism became the inevitable next step. This book looks at the type of painting which was central to Impressionism – the plein air landscape – and traces its development from inception by Desportes in the latter years of the seventeenth century, through the Barbizon School, to its peak in the late nineteenth century. You may recall Anthea Callen as that rare combination of academic, practising painter, and expert on the history of art materials and techniques; her books on Impressionist painting techniques have no doubt informed and inspired many painters. These are very high ambitions in a single book. that “the heyday of the quickly painted Impressionist oil-study-as-finished-painting was essentially limited to the 1870s”, and that studio reworking was commonplace among plein air painters, particularly Impressionists (p 22). My mind already filled with counter-arguments, I was looking forward to reading the case for each of these somewhat surprising claims later in the book. Each of the four chapters has been written so that it is relatively self-contained. Rather than tackling, for instance, equipment, supports, and paints in one chapter, Callen includes a section on immediately relevant technical issues in each chapter. As a result, within each chapter the subject changes rapidly, a feature for which the reader should be prepared. The first chapter sets out to detail the pre-Impressionist history of plein air painting, up to 1850. This starts with the pioneering work of Desportes, known better for his Court animal and hunting scenes. Previous accounts have assumed that he was an isolated forerunner, but Callen takes de Piles’ writings as evidence that others succeeded him, even though their paintings have not survived. Details follow of the easels and ‘paintboxes’ then available. Although there is passing mention of the need to store and carry wet paintings, Callen does not describe the various systems and carriers which have been employed by plein air painters to address this still quite tricky problem, nor how those who painted on paper coped. The latter remains a puzzle to me, as I find rigid supports difficult enough to transport in special carriers once those supports have been painted. She refutes the modern idea that painting using oils in pig’s bladders was exceptional or particularly hard, and points out that, whilst some paints were available in tubes from the 1840s, bladders remained cheaper and popular until about 1860. There are also excellent sections on paper, board, and canvas supports and the grounds used. Even having read this chapter, I still find those sentences hard to comprehend. My previous understanding was that use of the knife as a painting tool was linked primarily to impasto techniques, and that it had been used quite extensively by Rembrandt, Goya, and others, and she gives good examples of this. Courbet was an exponent of the knife throughout his painting, irrespective of genre. Indeed, Callen misses the opportunity to illustrate the book with an example of Courbet’s plein air knife work, perhaps in one of the paintings that he made of the Doubs River and area during his campaign there of 1864. Her discussion then moves rapidly through freemasonry, trowels as a symbol of masculinity, and she returns to the subject of the equipment used for plein air painting in oils, before concluding that the trowel had become Courbet’s symbol as a “skilled master-builder-mason”. Chapter three starts by giving us a little more of the history of palette and painting knives, a topic previously covered some 40 pages earlier, before comparing the use of the knife in landscape paintings by Courbet, Pissarro, and Cézanne. Here Callen makes excellent reading, and progresses to establish the differences between Cézanne’s painting in Northern France, where the weather was more changeable, with that near Aix, where the stable periods of very bright light allowed multi-session paintings. After a small digression into the not entirely relevant topic of Cézanne’s use of the knife in the later paintings in his Bathers series, the chapter ends with brief consideration of Pissarro’s Neo-Impressionist years. She considers this to be a period “when the democratically uniform touch that in theory ‘effaced’ the individual gained credence as a social leveller among utopian socialists.” (p 209). This jars with my understanding of Pissarro as a lifelong anarchist, though, and the Divisionist claim that it was primarily a ‘more scientific’ method of painting. 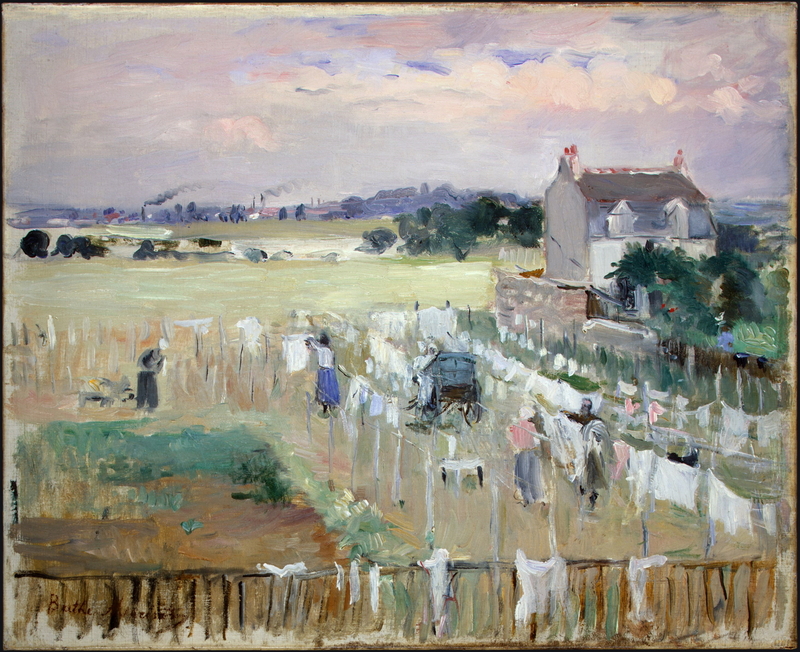 The fourth and final chapter is centred on Caillebotte’s painting Laundry Drying on the Banks of the Seine, Petit Gennevilliers (1892), a large canvas of around a metre by a metre and a half which on grounds of size alone would not normally be considered a strong candidate for having been painted en plein air. One particularly difficult issue in any potentially plein air painting is working out whether it was all accomplished in a single outdoor session, and how much was done during later outdoor sessions or in the studio. Although the Impressionists became adept at making paintings look as if they were dashed off in a flurry of strokes in but an hour or two, careful examination of many has shown that some layers of paint were applied onto a dried paint surface. Given the period required for even accelerated drying of oil paint, any trace of such wet-on-dry work proves that the painting cannot have been completed in a single day. However just as she is getting to that, Callen digresses to discuss techniques for the depiction of turbulent seas, which moves on again to examine the depiction of reflections in calmer waters. This results in a flashback to the myth linking Impressionist plein air painting with the availability of paint in tubes, a subject which she had first visited some 150 pages ago. Once she returns to examine the claim that Caillebotte’s painting was at least started en plein air, her extensive and meticulous discussion, over pages 224 to 241, is for me the high point of the book. She then considers the potential symbolism of ironing and other forms of work, before revisiting portable painting systems based on Seurat’s idiosyncratic croquetons. Berthe Morisot, Hanging the Laundry out to Dry (1875), oil on canvas, 33 x 40.6 cm, National Gallery of Art, Washington DC. WikiArt. The chapter rounds off with a discussion of colour palettes which seems rushed given the wealth of her material, before the text comes to a rather sudden halt. Although information cited appears generally reliable, I was a little surprised to see on page 87 that Callen still believes the myth that Dr Guillotin invented the Guillotine, something that even a cursory glance at Wikipedia should have dispelled. For a book concerned with plein air painting, the illustrations, though of high quality, are small, and many (I count 45 of the total of 200) show studio paintings of limited relevance to the subject. There are, though, some plein air gems to enjoy. The aftermatter contains good and extensive footnotes with references, an excellent bibliography, and a good if rather busy index. This is a book which, you will have gathered, can be a frustrating read at times, largely because of its non-linear argument, and lack of periodic summaries. Indeed, I felt quite let down at the end of Chapter four when there was no concluding chapter to draw together the many different threads of the previous chapters. This is a shame, as much of its content is of great interest, a lot is quite novel and well-supported by evidence. If you were to try to read it fairly quickly, you could find yourself suffering repeated déjà vu when you run into the next iteration of the threaded discussion about knives, easels, or Prussian blue. Excellent and fascinating though it is, I have not come away with much clearer ideas of the ambitious goals set out in its introduction, nor to my initial questions raised in response to those claims above. Berthe Morisot’s plein air and landscape painting receives surprisingly little coverage, and I can see no case being made for her “nerves of steel”. There is very limited examination of the career of ‘artist’, insufficient for the broad context required to justify it as a “craft practice” in the past. There is no examination of any prohibitions to women over engagement in plein air painting, nor landscape more generally, nor is there consideration as to how Morisot seemed to have overcome such prohibitions. Neither is there any attempt to relate the rise in French plein air painting in the late eighteenth century to military topographical drawing, a subject which seemed to vanish after being brandished in the introduction. 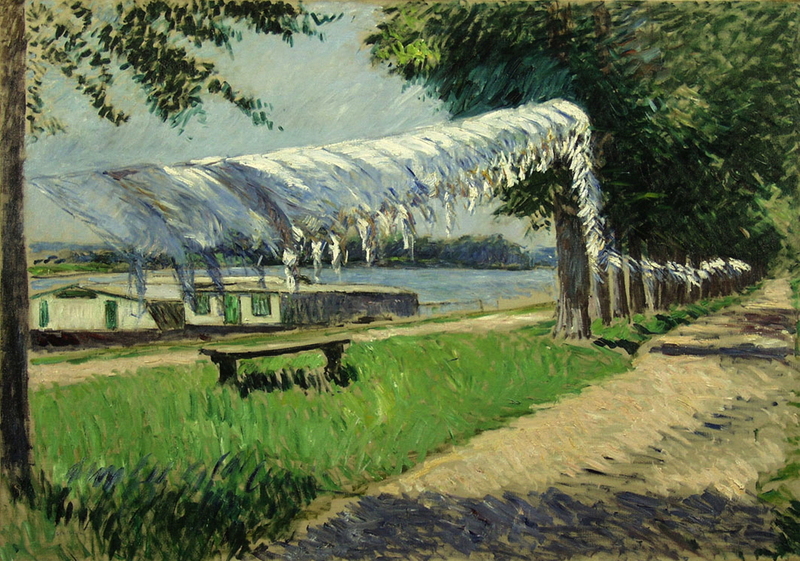 Although a few paintings, most notably Caillebotte’s Laundry Drying on the Banks of the Seine, Petit Gennevilliers (1892), are examined with respect to their making en plein air, the number of works and the range of painters is too limited to draw any firm conclusions as to the frequency of studio completion. The opportunity is missed to compare Cézanne’s early and late paintings in Northern France in this respect, Sisley’s work is barely mentioned, Pissarro’s late series paintings pass without comment, and Monet would surely be mortified as his lack of coverage. That said, this is an important book for anyone interested in plein air painting or the history of landscape painting, and should be read by anyone serious about understanding Impressionism or nineteenth century French art. Posted in General, Painting and tagged Caillebotte, Cézanne, Courbet, Impressionism, landscape, Morisot, painting, Pissarro, plein air. Bookmark the permalink. Will we Go or Rust?